transformed by the data revolution (retail, banking, communications), automotive has been mostly on the sidelines. But that is changing fast, and on a grand scale. 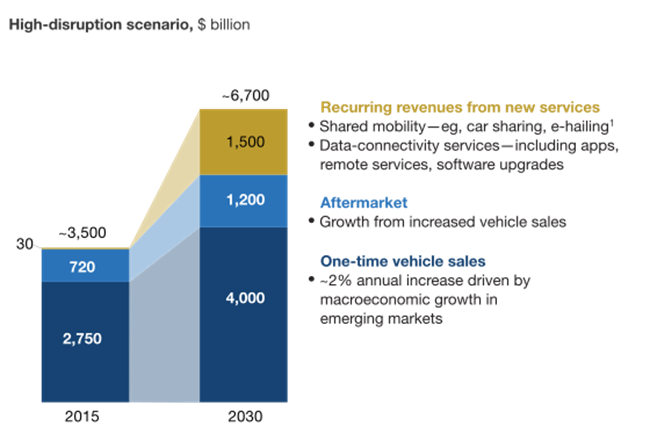 In 2017 car companies will make the majority of their revenue from the sales of vehicles, but by 2030, the majority of the income in automotive will come from data and data related services. Sounds impossible? Check out the graphic below. What Does This Mean For Automotive? Currently, vehicle line-ups are dictated by “hard” factors such as vehicle size, passenger seating, drivetrain (engine power, FWD, AWD, etc.) and purpose ( luxury, sports, economy, off-road). For the past 2 decades, there has been an increasing overlap of capabilities and consolidation of drivetrains. We are now seeing mid-level vehicles that come standard with AWD, advanced safety features, great fuel economy and more than adequate performance. In fact, some of the current crop of mid-size crossovers offer performance that would have been the envy of many 1960’s muscle cars! With companies like Tesla and others continuing to create vehicles that seamlessly combine luxury, safety, economy, and performance, look for the mechanicals of vehicles to take a back seat to technology. 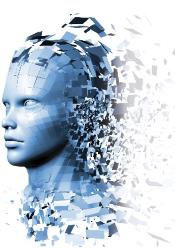 Data capabilities will be the new driving force behind model differentiation. The evolution of the automobile from merely a mode of transportation to a high tech mobility, communication and entertainment device has attracted a great deal of interest from tech companies. They see opportunity in the combination of new hardware and technologies that will be needed for connected vehicles, as well as the vast streams of data that vehicles will send and receive. These data streams represent a potential source of income and a way to reach new consumers. For several years, Google and Apple have been working with automakers to develop their respective car apps, Android Auto and CarPlay. These apps offer consumers the ability to connect their smartphones, wearables and tablets with their vehicles. This allows for greater integration and personalization of messaging, contacts, email, music and entertainment within the vehicle. Your car will soon be able to also connect with your home, as both Amazon’s Echo/Alexa and Google’s Home will feature integration with vehicles in the near future. In addition to Apple and Google, we also see Intel, Samsung, NVIDIA and others diving into the automotive arena. 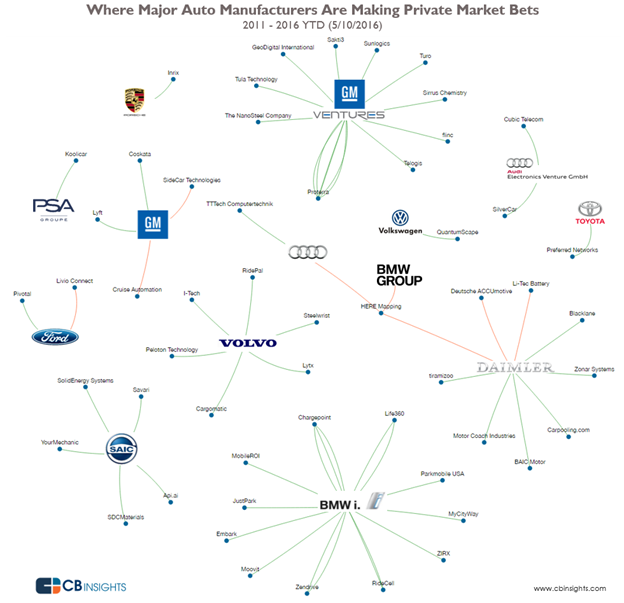 Below is a very insightful overview of the connections between OEMs and their investments in technology. The net result of all of this cross-investment is a blurring of the lines between technology and manufacturing companies. Ultimately, it will be difficult to categorize a company as being an auto or tech company or to define something as a vehicle or smart device. The common threads that will define and link everything together will be data and mobility. It’s definitely too early to make long term predictions as to winners, losers or even the pace of change. However, a few things are likely to happen in the very near future. Dealers should expect more consumer questions around compatibility between their new vehicle and their smartphones and their home devices. Cellular providers (led by AT&T) are already creating data plans for connected vehicles and this will most certainly become more prevalent in 2017. Just as Apple, Samsung and others have partnered with cellular providers, it seems natural that OEMs will do the same. Lastly, expect more collaboration (and clashes) between OEMs and their tech counterparts as they continue to transform the automobile. The re-definition of the automobile is underway and rapidly accelerating, and it will be easy for even the biggest players to be swept aside. Disruptions of this magnitude occur infrequently, but when they do, they tend to favor the bold and the nimble.